Everyone had great fun today working hard in the sunshine! Over the past few weeks Squirrel Squad have been visiting the Sound box on a Friday afternoon to investigate and play lots of exciting instruments. We have been practicing...….. tapping, hitting, shaking, plucking, rubbing and pressing! Helen Farman (hfarman) on: Mud! Squirrel Squad had a fabulous time in the sunshine last week making mud and footprints linked to our focused text - We're Going on a Bear Hunt. We made the mud from Bisto gravey browning, flour and water.... it is very effective and a little goes a long way as we found out!! We also made very sticky mud and our bears got stuck in it! Squirrel Squad love looking at books and pictures every day. Everyone looked fantastic for World Book Day, lots of different characters! Helen Farman (hfarman) on: Pancakes! Squirrel Squad enjoyed shaking the mixture and watching the pancakes cook! But the best bit was trying the toppings and eating the pancakes. Yummy!! Love is in the air in Squirrel Squad this week! All the children have had a very busy week making lot's of lovely Valentines gifts for the Special People in their lives. We have taken lots of pictures of the children making all their gifts for you to look at. We hope you all have a lovely Valentines Day and enjoy half term next week. What a busy time we have had since coming back ……. Lots of investigating, tasting, mixing, moulding, stretching, matching and counting!! We have been investigating oranges, tomatoes, apples and cucumbers using a range of tools to cut, squeeze and squash the fruit and vegetables. Cocoa powder was the magic ingredient last week, everyone had fun making mixtures, slime, dough and a big mess!! What a fantastic day it was on Wednesday at our Stay and Play! The children were all excited to see you and enjoyed making the Christmas crafts and visiting our winter wonderland in the sensory room. We hope you all had a great time and enjoyed the festive fun! On Tuesday morning The Squirrel Squad had a fantastic time getting ready for rainy play. They put on waterproof trousers, jackets and wellies to keep dry. Once outside it was Splish Splash Splosh! Helen Farman (hfarman) on: Clean Mud! Apologies in advance if they have tried this at home! Our children in Squirrel Squad continue to have great fun with pumpkin investigations raw, steamed, roasted and boiled. The children used a range of tools and equipment to explore the different textures…. Cutting, mashing, squeezing, scooping and scraping. We wanted to share with you some of our Squirrel Squad members playing musical instruments! 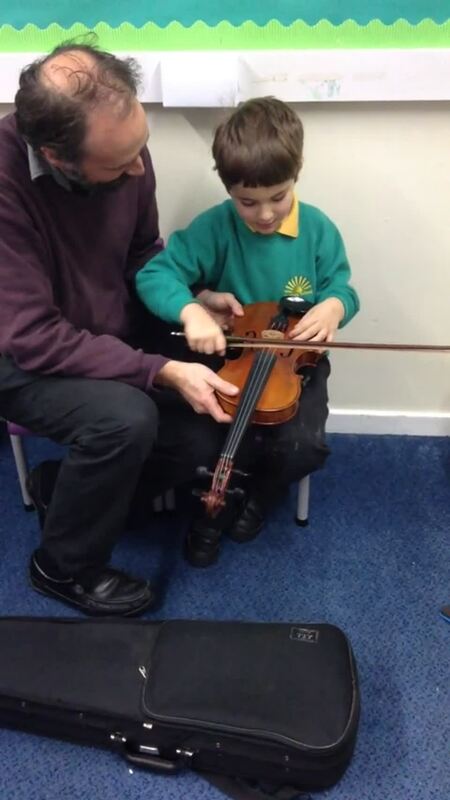 We are very lucky at school to have Adam and Daniel our Music teachers. They enable our Squad to access fantastic musical opportunities and learn how to play/experiment with the instruments and follow beats. Sarah D, Helen and the EYFS Squad! I hope you all had a great week off! We just wanted to share some photographs from yesterdays bonfire and fireworks outside in the garden. All the children really enjoyed watching the crackling fire and the different coloured fireworks! Some of the Squad created their own firework pictures yesterday too! What a difference a term makes! We have learnt so much this term, not just the children but the Squad staff too! The children are now all settled into school and are following routines using signs, symbols and songs to cue in. We have daily communication sessions along with literacy and numeracy and we can't believe how much the children have progressed and are now doing some fantastic sitting, looking and listening. The Squad staff have also learnt so much about your children too, what their interests are, what they like to eat and drink, how they transition, what motivates them and also how to challenge them so they develop their skills and continue to achieve. This afternoon we have our School Halloween party we would like to say a huge thank you to all the parent/carers who have donated food and drinks. I'm sure the Squad are going to have a great time this afternoon. Here are some photos of the children this morning in their costumes/ civilian clothes! The Squirrel Squad have had great fun investigating the exciting resources in the sensory room! The children were really focused and concentrating on good looking skills. This week Squirrel Squad have used their investigation skills! We have looked at leaves that have fallen off the trees whilst hunting for bugs, rolled pine cones down the ramps, printed with pine cones, observed the natural resources through light boxes and used our senses to experiment with different types of vegetables. The Squad have taken it in turns to share the vegetables and joined in touching and tasting them, carrots were a favourite but not so much the onions so we used our fine motor skills to peel them! Sarah Dwyer (sdwyer) on: Squirrel Squad! The Squirrel Squad have all settled in well and are really enjoying their time at school. The Squad are accessing soft play, sensory room, swimming and some of us have had a visit to garden school. Here are a few pictures to show you what a busy few weeks we have had so far! Sarah, Helen and the EYFS Team.